Wood Destruction by a Woodscrub: Better Turning? They were not sharpened properly- The tools had several angles ground into them creating a convex shape. Properly sharpened tools are straight or concave (slightly hollow). 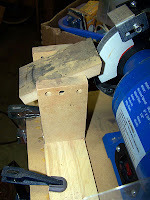 This allows proper use of the bevel when cutting. I was applying the tool incorrectly- I did not use the tools properly because from the beginning they were not ground properly (see above). So when I was attempting to sharpen them, I was not achieving anything other than to duplicate the way they arrived. This led to me failing to "ride the bevel". I was using all the tools as scrapers instead of cutting tools. That led to catches, shattering handles, bent tools, etc. I really wish I had taken pics of the tool tips as they arrived. But these being my first set of tools, I had no idea they were anything other than acceptable. Watching some video and reading some books led me to my first revelation: Sharpening. I was sharpening the tools very poorly, adding facets and a convex shape to the bevel. A very quick and dirty jig for my grinder changed that. It's made from 3/4 MDF, glue and screws. The angle of the bed is easily adjustable by loosening a screw and moving the bed. A protractor of some kind is still needed to get any repeatability, but I find that setting the bed with the tool against the stone works as long as the bevel angle is trustworthy. Light touches, and a cup of water nearby keep from blueing the carbon steel. I have in my budget to buy proper tools soon made from HSS and much more substantial than these flimsy little guys. My second revelation came when I discovered cutting angles. Having the tool at right angles to the spinning workpiece is rarely the proper orientation. I found that cutting from side to side makes a world of difference. As does riding the bevel. The wood practically just falls off the workpiece when I find the sweet angle for that cut. I'm still learning and making mistakes. That's cool. I'm having a blast anyway! The mug in the rear is made of laminated maple. That was done purely with my poor sharpening and tool control techniques. Good results, but took way longer than it should have. 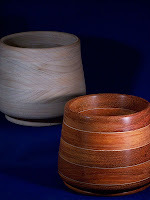 The mug in the front is padauk and some kind of yellow wood veneer between the laminated layers. I started it with the poor technique, with it taking even longer than the maple one due to padauk's toughness. But the lessons learned were applied to it at the end, and even the padauk came slicing off with ease using properly sharpened tools and good technique. 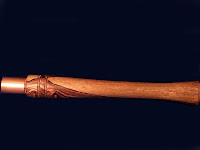 The tool handle is cocobolo. Talk about a difficult wood to cut. I was at the grinder ever 2 minutes or so. The coco would dull the tools faster than anything I've cut so far. But it has an amazing grain and looks outstanding. 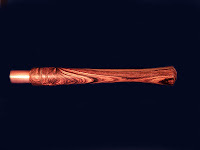 The play between the sapwood and heartwood is beautiful. The photos don't really do it justice, which is too bad. 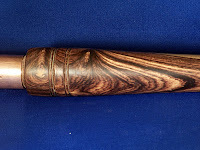 It is finished with just beeswax applied on the lathe. The ferrule is just a copper 3/4" plumbing coupler from Lowe's. 75c each. I ground it down a bit shorter than it was originally. I still need to polish it. The thing is just stuck on there for now to get a feel for how it will look completed. I added the little details at the front of the handle to give me a tactile warning when I'm choking up really high. Keeps me from having to look at my hands when turning, I know exactly where they are now. I haven't decided which turning chisel to award this beauty to.